The problem is that you have to dial not only the conference service number (which you can potentially speed-dial or even voice-dial), but also access codes, PINs, and/or other numbers. If this information is stored in your calendar, good luck bopping back and forth between that and your dialer -- and remembering every digit. Finally there's salvation in the form of MobileDay, an ingenious app that lets you join conference calls with just one tap. When you first install the app, it scans your smartphone's calendar and automatically imports any upcoming conference calls. 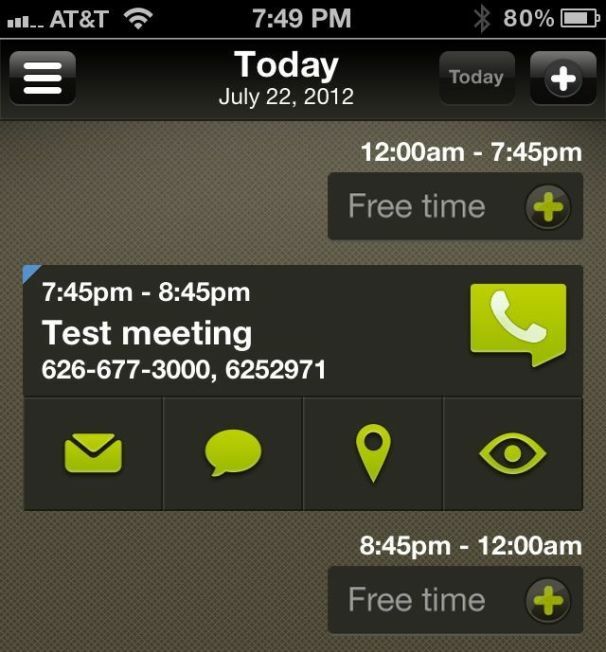 You can also schedule calls manually; either way, the app pops up a reminder when it's time to dial in. And dialing in is literally a one-tap affair. There's even a test-call option so you can make sure everything works before the actual call. I will say that MobileDay isn't immediately intuitive, especially if you don't already have some calls on your calendar. I recommend checking out the how-to guides for a little help on getting set up. The upshot is that if you're already hooked up with one or more conference-call services, you can configure those within the app -- though this process can be a little confusing. For example, MobileDay requires a "Host ID" as part of the configuration, but the service I'm using -- FreeConference.com -- doesn't have anything with that label, only an organizer access code and participant access code. Thus, you might experience a little trial and error in getting everything set up properly. That said, when the time came to dial in, MobileDay worked like a charm. And I like its options to quick-send an e-mail or text to other participants (like "I'm running late" or "start without me."). Very handy. For anyone who routinely dials into conference calls on the run, MobileDay is a godsend. Best of all, it's free. Speaking of apps and conference calls, be sure to check out my previous app spotlight: Set Up Conference Calls on the Run with FreeConference Mobile.